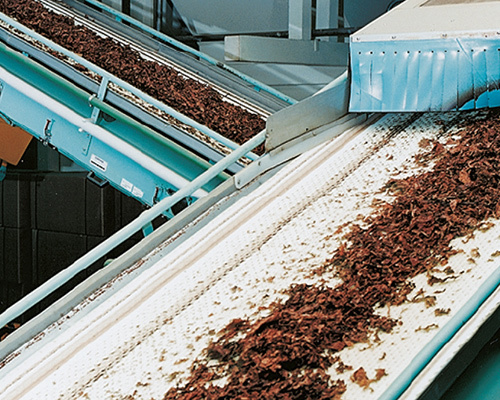 Tobacco processing is one of the critical processing that demands a higher level of attention to equipment used during the processing, amid conveyor belt is common that comes in contact with the tobacco while processing and therefore its selection is decisive to ensure the safety of the end product. We as a conveyor belt manufacturer embrace profound knowledge of the tobacco application requirement and enriched with the technology enabling us to obtain the high quality rang of the conveyor belt that can be matchless solution for your tobacco processing need. The material (PVC/PU) used in the construction of the offered conveyor belt for tobacco processing has undergone pyrolysis test to ensure the material is free from nitrogen, sulphur and halogens even when subjected to the combustion and thusly makes it the most reliable approach for the tobacco processing industries to safely process tobacco. Other than processing, this tobacco conveyor belt is being an effective platform to convey fresh tobacco efficiently and maintain the highest level of freshness at the same. Whether your requirements is to convey simply fresh tobacco, convey stem tobacco, tobacco leaf or process, our tobacco conveyor belt meets FDA regulations and promise to deliver higher return on investment, thanks to easy release and easy clean (prevent contamination) attribute of the PVC/PU material along with ability to thrive under diverse environmental conditions without failing. We as a tobacco conveyor belt manufacturer have proven our expertise by delivering outstanding solutions for their flat, inclined, troughed conveying of the tobacco, we have everything from cleats, sidewall, profiles and the technology to effectively fuse them with the any pattern of conveyor belt, making us the world famous in the tobacco industries.